Despite plenty of product rivalry, these sandal companies have developed unique, thriving brands that stand out from the rest. Flip-flops have matured from their surfer roots to become acceptable footwear not just on the beach, but also in everyday life. With sandals showing up everywhere from the office to weddings, footwear companies have had to find ways to differentiate their thongs from the rest. Think about brands like Birkenstock. Just hearing that name makes people automatically envision the famous style. For Rainbow Sandals founder and president Jay R. Longley, Jr., he's been working at differentiating his company for more than 30 years. Based in San Clemente, California, Longley has grown Rainbow Sandals into a brand notorious for quality and a long lifespan. In fact, Longley frames and hangs 20-year-old Rainbow sandals people have sent back to him to prove how long they've lasted. Longley didn't originally intend to build a multimillion-dollar brand; he just wanted to create a flip-flop that would last longer than one summer. So, in 1974, he took out his sewing machine and got to work. Once he perfected the sandal, the next logical step would have been to launch a marketing campaign. But he quickly found out he didn't need to. To this day, word-of-mouth has been the company's best form of marketing. "What people saw as a functional item became fashionable," says Longley. 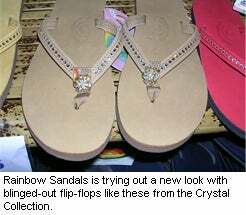 In 2006, Rainbow Sandals brought in approximately $40 million and projects an estimated $50 million in sales this year. But Longley still isn't content. The company is now focusing its efforts on the female sandal shopper by introducing what Longley calls bling-bling crystal-embedded sandals retailing for about $80 and more basic thongs with colored leather retailing for $44 to $48. Longley says the brand isn't abandoning its roots, but is playing around with some fun, unique concepts to keep the brand current. Though Sanuk hasn't been around for half as long as Rainbow Sandals has, its funky footwear is getting noticed. Founder Jeff Kelley got his start in beachy footwear when he helped brothers Fernando and Santiago Aguerre building their popular Reef brand in its early stages. About eight years ago, Kelley's love for quirky shoes led him to create a novel line of footwear that doesn't focus on one particular type of shoe. His unique materials, like indoor-outdoor carpet for one of his early flip-flops, helped Sanuk get noticed not only by surf shops, but also by high-end stores such as Fred Segal. From that point on, Sanuk has been known for the innovative products created by Kelley and his core team of six in their Cardiff-by-the-Sea, California offices. Last year, Kelley says sales doubled, thanks in part to a new creation he calls the "Sidewalk Surfer"--a combination sneaker and sandal that retails for about $45 to $80. 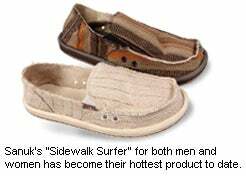 It was introduced last year and already has become one of the hottest items Sanuk sells. Kelley describes his brand's direction as "SuperFunktional." "We're making functional products, but keeping the 'funk,'" he says. "That one word really describes who we are." Bernardo Footwear, on the other hand, isn't known for being funky or for being a favorite of surfers. The Houston-based company is known, however, for creating the modern-day sandal. The company, originally founded by renowned architect Bernard Rudofsky in 1947, creates higher-end footwear and handbags. 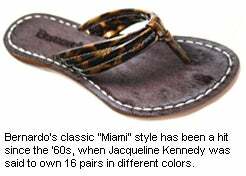 Bernardo is perhaps most famous for its "Miami" sandal, a favorite of the jet-set crowd in the '60s and '70s. Though Rudofsky has since passed, the company's new owners have worked hard over the past six years to re-introduce the Bernardo brand to the public. Designer and co-owner Dennis Comeau and co-owner and CEO Trae Smith teamed up to forge a mainly family-run business comprised of about 15 employees. Comeau says the company has experienced double-digit growth each year over the past few years. This year, they expect to bring in about $10 million. But it wasn't easy. Comeau says when he and Smith purchased the Bernardo name, the shoes were being made with cheaper materials. They set out to bring back the quality, but at a reasonable price. Bernardo sandals retail for $90 to $200. Comeau says the company is expanding by offering other types of footwear, including ballet flats and boots. They'll also continue updating their materials and colors and will dabble in men's footwear. "We're not looking for our 15-minutes of fame," he says. "It's about evolution. We're constantly sketching and looking for new trends." Innovation is the key to staying relevant in the shoe industry. According to the main blogger for Shoeflyer.com, Patrick Marzullo, it helps a brand withstand the test of time. "As long as they keep innovating, they'll stay hot," he says. This summer, leather is the material of choice, he adds, citing a Biviel sandal as one of his favorites. For more casual flip-flops, there are several creative concepts on the market this summer, including Klip-Flops. They're flip-flops with interchangeable straps, retailing for $22, plus $10 for additional straps. Klip-Flops, created by Pamela Krutilek, founder of the Jaspen Company Inc., have been on the market for about three years now, but are starting to pick up momentum following recent publicity. According to Krutilek, the company has more than tripled its business since last year. A recent arrival to the U.S., FitFlops are designed to tone your legs with each step you take. The idea for the fitness sandal came from Marcia Kilgore, founder of London-based BrandHandling Limited. Though they're just being introduced in the U.S., FitFlops are already a hit in London. In fact, a specialty sporting-goods store in London sold out of its initial 90 pairs in three hours.